With a SkyMall coupon or online deal, savvy shoppers can save on unique gifts and innovative gadgets. The Sky Mall magazine catalog isn’t needed to shop, since you can browse a huge range of products online. Just be sure to look on this Sky Mall coupons page first to check for the latest discount deals and promotions. While traveling for business or pleasure, you’ve probably come across a Sky Mall catalog. Geeks like unique products that you don’t find in everyday stores, which is what makes this such an entertaining place to shop. You don’t have to be on a plane to browse their catalog, however. You can log onto www.skymall.com to shop for home, outdoor, electronics, and apparel products. 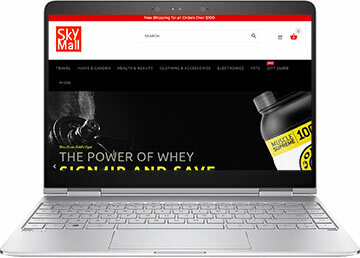 SkyMall.com has travel products of course (luggage and the like), but it also retails toys, games, sports gear, home living items, health and wellness products, outdoor living supplies, pet products, and clothing and accessories. Tech lovers will probably be most interested in the electronics and gadgets section of the website. There you will find everything you want from home monitoring to iPhone accessories. They retail unique electronics such as the cell phone spy recon, which enables you to easily access a Smartphone’s data from any Internet enabled computer and view all of the e-mails, text messages, and numbers called; it even allows you to tap into the phone’s GPS to find its exact location if it’s lost. The SkyMall magazine sells lots of other cell phone accessories as well, including the cell phone spy text reader, iPhone charging sleeves, wooden iPhone cases, Bluetooth kits, charge and sync cables, steering wheel speakerphones, and much more. Through both the magazine catalog and the online store, the company retails binoculars, telescopes, and microscopes, as well as cameras and accessories. Shop the electronics department for digital cameras by trusted manufactures such as Nikon, Canon, and Samsung. Browse an assortment of charging docks and stations and find fun clocks such as the LEGO Star Wars alarm clock and the Atomic Alarm Clock Weather Man. Click on computers for everything from an inflatable screen and projector to a stealth iBOT PC monitor. Get laptop bags and caddies, a VHS to DVD converter, a Road Mice Car Mouse, a photo scanner, or a printer. Sky Mall also carries GPS devices and accessories from Garmin and Magellan as well as home security equipment including stealth, covert, and easy-to-hide cameras. Browse an array of language learning tools, musical entertainment accessories, and storage and organizer products. Finally, don’t miss SkyMall’s eclectic assortment of movies, music, and books.